Subway tile is a rectangular, brick-like, usually polished ceramic tile that reminds you of subway stations. Adorning kitchens, bathrooms and powder rooms, it comes in many colors and fits all kinds of styles, from traditional to contemporary. The best thing about subway tile? It's always fashionable. Like the little black dress, subway tile is the best choice if you want your bathroom to look great and retain its decor value through the years. Our first example is a traditional, classic white subway tile with contrasting, dark grout, by Spivey Architects via Houzz. This beautiful bathroom features a full subway tile wall in the shower, as well as a half-wall as​ a backsplash behind the door. If you want to avoid the boring all-white effect, choose a darker grout, as in this bathroom, for contrast and visual interest. Same tile, different orientation, a whole lot of fun: this herringbone inset in a white subway tile shower is interesting and eye-catching in this design by Classic Casual Home. The tile is the exact same, but in a different orientation: herringbone, in this case. It's an easy project that doesn't add to your renovation costa and adds a whole lot of design value. This traditional bathroom by Four Brothers LLC, via Houzz, is an excellent example of how you can accent subway tile with a small strip of colored mosaic. In this case, a varied blue tile marks the mid-wall, separating the light blue paint from the white subway tile. That strip is perfect for choosing accent colors—in this case, light blue on the wall and towel. A simple, classic bathroom design that's easy to implement, too! The subway style doesn't always have to come in boring, uniform ceramic. This subway-cut marble tile features gold and gray veining, perfect for effortless color and movement. This bathroom by Carriage Lane Designs shows that a classic subway pattern can use different stones for surprising effects. This gray-bordering-on-tan subway tile shower (all the way to the ceiling!) proves that the subway tile pattern can suit any style. A design by Corea Sotropa Interior Design, this shower features a vintage shower head with gold finish, which brings out the neutral tones in the tile and inset mosaic. Insert a contrasting subway tile in a different direction for a break in an otherwise monotonous white tile pattern, as in this bathroom by Woodstock Cabinet Company, via Houzz. All you need is a small amount of a different colored tile; install it at a different angle to the rest, and voilà! Few things are more minimal than black and white—and few things are as classic as subway tile. 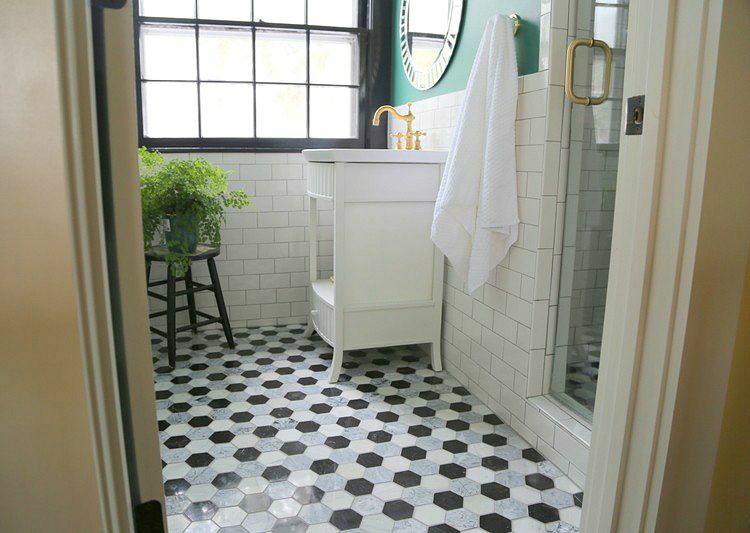 Fitting the two together—a white subway tile on the walls and a black subway tile on the floors—makes this bathroom, by Castle Building & Remodeling via Houzz, a really interesting take on modern design. The polished finish works great to illuminate the space, which would otherwise be rather dark. With a more colorful version of subway tile that we've seen yet, this green shower by Anik Pearson Architect shows how subway tile can fit more daring designs. The natural stone floor, bench, and rain shower head make this shower feel more like a forested getaway than a closed shower in a bathroom. The strength and direction of the lighting are essential for this space to work. There's nothing special about this subway tile in a bathroom by Absolutely Beautiful Things. But it's here to show you that subway tile is the perfect backdrop for vintage or eclectic styles. It's seamless and classic and doesn't distract from more stimulating elements of your design. Get tired of your mismatched mirror and rustic vanity? Change them up to something more modern without needing to change the tile—because it will accommodate any style. Subway tile also suits different patterns, like this flowered black and white wallpaper choice from Studio McGee. The mix of rectangle, circle, and pattern is surprisingly not as overwhelming as you might think. And, of course, as a blank canvas to start off from, a classic white subway tile opens up infinite decor possibilities. Here's another example of the minimal, modern effect of a stacked subway tile pattern, by Design*Sponge. In this case, the round mirror breaks up the rectangular repetition, and the natural wood vanity adds some warmth. The tile here is more subtle than #9 above because it's not beveled, and it does have a slightly less heavy feel. Porcelain, glass, marble, ceramic... What's left? Right, slate! This beautiful natural slate subway tile, in a bathroom by Urrutia Design via Houzz, has enough variations to let you play with different shades of gray in the rest of your decor. The subtle color changes bring out the classic regularity of the brickwork pattern. Another proof (if you still needed any) that subway tile fits any style: in this case, an industrial bathroom by Michelle Law, via Houzz. The white, semi-matte background is perfect to contrast the black, metallic sheen of the light fixtures, shelving, and mirror. White subway tile is truly a flexible design choice that lets you change your style without having to change your walls. Subway tile is also great for making your own patterns out of a variety of tiles; in this case, square and small black tiles are arranged to produce an Art Nouveau-style design that suits the retro freestanding tub perfectly. This design by Barnes Vanze Architects shows the versatility of subway tile. Most of the examples we've seen so far use small or medium subway tiles. But this one uses quite large tiles, which has a completely different effect than the smaller ones (as you can see from the hex tile on the floor.) 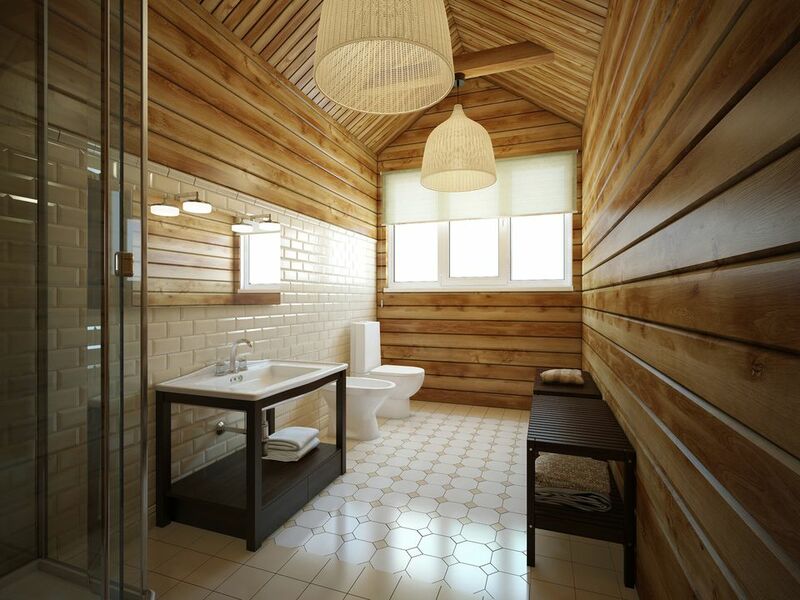 This design by HighCraft Builders, via Houzz, shows how a large subway tile can enlarge and lighten up a space.